Coton Morris are a Cotswold morris side based in the Cambridge and South Fens area. 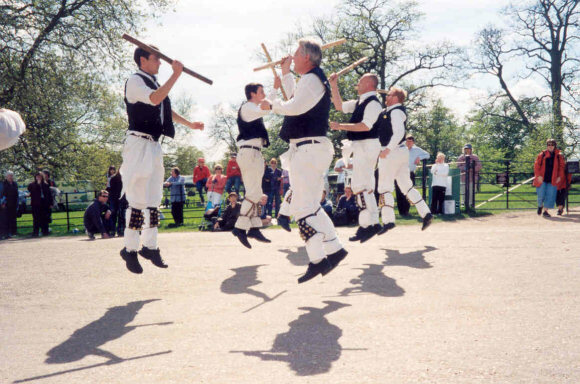 If you are not interested in joining in dancing, but want to watch, find out what we are about, why anyone would want to perform such a bizarre, interesting and historic pastime, then come along to one of the following pubs (there's a clue...) at the allotted time. This table is updated regularly, so come back soon to see where we might be. If you are reading this, it means you have a browser that will not display frames. To get the best of this website, I would recommend you look at it using a browser that can use frames. In the meantime, here's a photo of a hairy Scots git showing off.